This Saturday, August 11th at 2:57 AM PT, we will experience a Partial Solar Eclipse in 18'41 Leo. This is the last Solar Eclipse of the year 2018. Solar Eclipses bring new beginnings for us (and its energies last up to 6 months!). When I looked at the chart of this Solar Eclipse, I got so excited I almost cried happy tears! We are asked to invest into our dreams. We are given permission to allow ourselves to follow our heart, boldly voice our dreams and take our step into leadership. The next six months will help us change our narratives in regards to ourselves, our powers, our gifts, our finances, our situations, other people or whatever it is that no longer benefits our Highest Good. The energy of Mercury Retrograde assists us in going within and readjusting our self-talk and how we talk to others. Pluto Retrograde asks us to re-assess our need to control details and the sextile to Neptune guides us in stepping into the unknown and trusting that we are divinely supported in bringing our dreams into reality. Join my Facebook Group "in SYNC with LIFE" for deeper analysis and exclusive guidance. In Leo it urges us to align ourselves with our inner Divine self… our God/Goddess Self…. 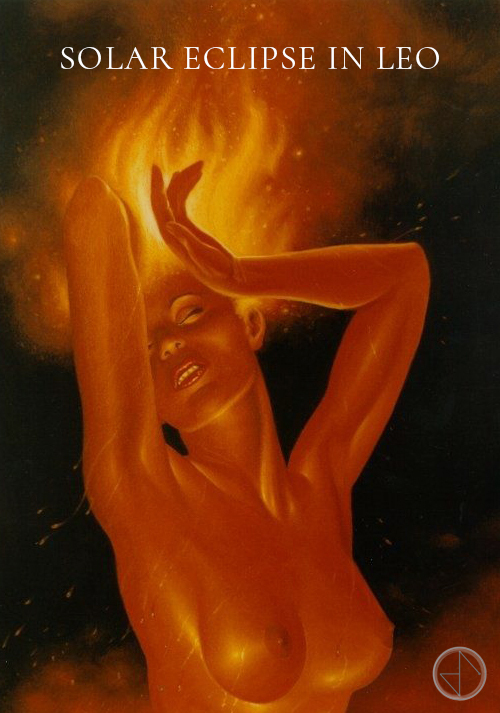 Bringing out the flames from within our heart, shining our light brighter into the world... No more apologies, no more worries and doubts, but a boldness of Divine LOVE, WISDOM and POWER is needed in this world. This New Moon cycle starts in Leo and comes to fruition with the Full Moon in Pisces on August 26th, shortly after Mercury turns direct again. Since this is a Solar Eclipse its energies also last until the Full Moon in Leo, which will be on January 21st, 2019. Check your Sun sign to see what area of your life is being activated during this Leo Moon cycle.. If you were born on a cusp, look at both signs. Use these days before the Solar Eclipse to go within and detect any narrative that you are ready to release… Reflect on what you want to manifest in your life, what do you need in order to truly live your purpose (it's all within you!). Don’t be afraid to ask your spirit guides and angels, or the Divine source for help. Ask and you shall receive. You are divine. I am divine. We are divine. It is time for us to embrace our glowing GOD/Goddess Self.